Chia seeds come from a flowering plant in the mint family that's native to Mexico and Guatemala, and it was a very important food crop for the Aztecs. It's remained in regular use in its native countries, but was largely unknown in North America until the last couple of decades. Some of their health benefits include boosting energy, stabilizing blood sugar, aiding digestion and lowering cholesterol. Many people are very deficient in Omega 3’s and as fish now has so many contaminants people are looking for safe and healthy alternatives to boost Omega 3 oils in their diet. So along come Chia Seeds! They contain 8 times more Omega 3 than Salmon! Wow. These little seeds which come in either white or a dark brown and black colour have a huge nutritional profile. It contains calcium, manganese, and phosphorus, and is a great source of healthy omega-3 fats. Chia seeds contain protein, fiber, calcium, potassium, magnesium, phosphorus and the essential fatty acids omega-3 and omega-6, as well as antioxidants. Ground chia flour contains much less omega-3, since the oil is removed during processing, whereas chia oil is a good source of omega-3 but with no fiber and little protein. Omega-3 fatty acids have been shown to reduce inflammation and help lower your risk of heart disease, arthritis and cancer. It’s important to get the right ratio of omega-3 to omega-6 fatty acids for optimal health. Not only is chia thought to contain more omega-3 than any other plant, it has a healthy balance of oils, with approximately 60 percent omega-3 and 20 percent omega-6. The perfect oil for health! Go Chia Seeds. 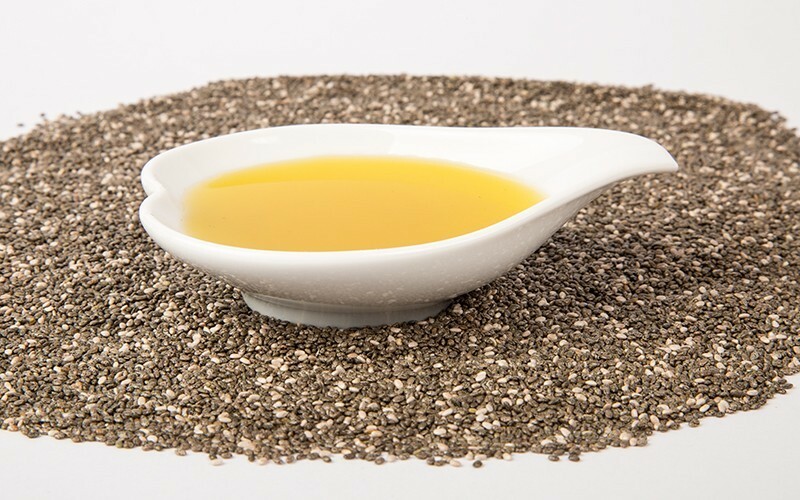 Chia seed oil has a pleasant nutty flavour. You can add it to smoothies, salads, dips, and sauces or anywhere you would normally add any kind of oil or dressing. Do not heat the oil, use as you would flax see oil and store in a cool place ideally in the fridge after opening.